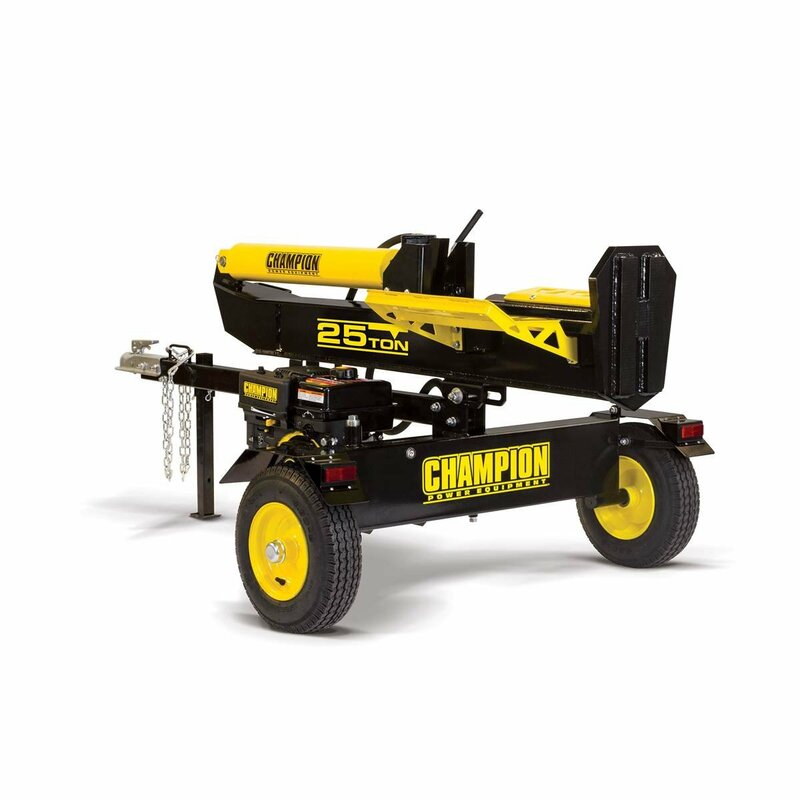 When it comes to log splitters, there are two types of mechanisms that you should consider. The more uncommon one, the kinetic types and the much more common hydraulic types. 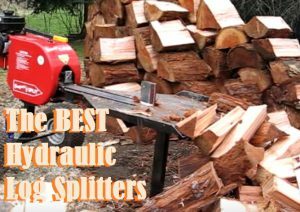 For the purpose of this article, I will be reviewing what I believe to be the best Hydraulic Log Splitters In 2017. Because they are the more common machines, there was more splitters that we had to sort through to end up with buyers guide. This list will feature 3 different ton limits, which range from 7 tonnes all the way up to the incredibly powerful 45 ton machine. By doing this, I am hoping to find a happy medium and serve a decent review up for more individuals needs. A log splitter for everyone in other words. Once winter starts to roll in I find myself year after year thankful that I have made the right choice in getting a hydraulic log splitter. The shear amount of work that it use to take splitting logs the old fashion way with an axe, or a splitting wedge and a sledge hammer, is nothing more then a memory once I got a log splitter. Even compared to a manual log splitter, there a noticeable improvement in speed and ease of use. Most winters now I’m easily able to split up to 10 cords, guaranteeing that I never have to worry about running out of timber mid winter to keep the heat up, or my wood burning stove going. There are many reason to want to get a hydraulic log splitter, but really the most simplest of reason is the best, and that it just makes splitting logs so much easier. No more having a sore back from swinging an axe, no more arguments about who will split logs in the middle of winter because you have run out of timber. No matter the reason you have decided to get a hydraulic log splitter, you have come to the right place to find the top rated hydraulic log splitters on the market in 2017. 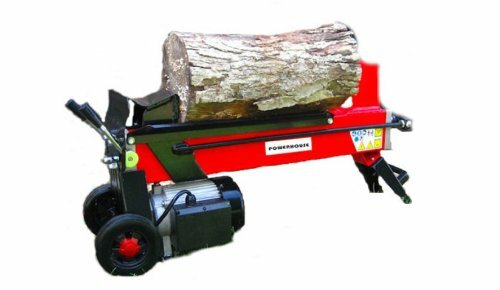 The one thing I looked for when I was searching for my own log splitter, was power and boy does the Log Wood Splitter have power. In fact a massive 45 tonnes of pressure. This beast tore right through 36 inch diameter logs like it was butter. When in comparison my somewhat older 27 ton log splitter couldn’t even get through the outside edges without the addition of ‘extra help’. . I’m a big fan of having machines that are quite over powered for the jobs. This is not some sort of ego thing either, It’s all about the longevity of the investment I made. Ie; expensive log splitter, I want it to last!. By buying bigger and better I don’t have to worry about overloading and stressing the machine as much compared to if I were to buy a somewhat smaller cheaper model. But that’s just me. I know that there are people who will be concerned with the fact that the motor on this hydraulic log splitter isn’t a Honda motor. Let me tell you, you aren’t alone here. This is normally a genuine concern because there are some dodgy motors out there. However, the engine on this log splitter has a very good documented history of running smoothly, very similar to a Honda. I often find myself using the electric starter, stopping and starting every 5 to 10 minutes just to clear the area, which is a very nice luxury. No matter what type of log I threw at this thing, it split it like it was nothing, even some extremely knotted wood that would choke up many other machines. I really enjoy how you can change it from horizontal to a vertical position for really large logs, I know a lot of splitters have this feature, but it’s important to me that it has this feature. For being such a heavy duty machine, I was pleasantly surprised at how quick the cycle time was for this thing, at an average of about 10 seconds. As much as I really love the Log Wood Splitter, it does have two issues and both are important. 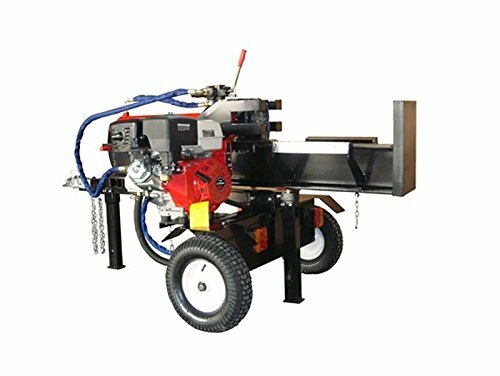 First and foremost is the price of this log splitter, it is very expensive so if you’re looking for a cheaper alternative, then below will be cheaper models. The second problem is quite easily fixed but it is highly recommended that you go around and tighten every bolt up on this machine, it will make life easier down the track. So you’ve decided that 45 tonnes is overkill for you, the next in line is the Champion 100326 25 Ton Full Beam Log splitter. I personally really like Champion as a brand I have several of there products. Including a generator for my smaller electric 7 ton log splitter. You will find that this log splitter should easily get through 10 cords over the winter season, which is more then enough power for those wanting firewood. When it comes to splitting logs with a log splitter, the big advantage is how it takes the manual labor out of it and saves your back. The Champion 100326 takes this one step further, with one of my favorite features on a log splitter that should be on all in my books. Which is the catcher on sides of this log splitter, so once you split a log the timber doesn’t just fall to the ground, so less bending over which is a great thing in my eyes. I really like how much this saves your back from the lack of bending over, which will make your life easier down the track. I did find that this log splitter could split logs much higher then it’s manufactures state, due the vertical position. Champions customer service is outstanding, when something went wrong they replaced the part it immediately. It has one of the easiest and smoothest pull start engines I’ve ever used. This alone is a a huge positive for me. Being a Hydraulic cylinder powered machine, splitting logs is not only easier, but it is also safer to use. This really is a minor issue, but still I felt I had to let people know on. The set up of this machine can get a bit tricky and will take anywhere from 45 minutes to 2 hours to set up depending on how handy you are. It is easier to set up if you have two people, just to help lift with certain parts, or use leverage. But once it’s set up, your in the clear. Nothing can get in your way. This is the perfect hydraulic fluid log splitter for someone who doesn’t rely on wood year round, but needs to split logs enough to warrant ditching the axe. The Powerhouse Xm-380 Electric Log Splitter, will still put the work in where it counts.It’s just that like with most things powered by energy, they are typically inferior to a gas powered machine. I was quite surprised with the size of log you could split with this machine. While the manufacturer states it can handle 12 inch in diameter, we found we could do larger logs fairly easier. But this did involve splitting off the edges and working our way inward. There are a few reason why I decided that this was one of the best hydraulic log splitters going around in 2017. I personally feel that this is the best price for how much work it could produce to some of the cheaper and even more expensive splitters. One key feature that I really like on this machine is that when you press the start button, it stays on and you don’t have to hold it in while you operate it. This is not always the case with these king of machines. One of the best electric machines, especially in the 7 tonne category. This is becasue the Powerhouse boasts a true 7 ton of RAM force due to its 3.5HP. Other knock off 7 tons may only be housing a 2 HP machine. A portable and rather easy to maneuver machine. Weighs around 100 pounds so do lift with care. But the wheels and carry handle make walking from location to location with the Powerhouse, quite literally a walk in the park. Easy to use. My Parents both in their 60’s can operate this machine. In fact they were the ones that suggested this machine to me. Cuts just about anything from Oak to Maple. Holds the oil well and doesn’t need to be changed as often as I thought it would. Comes with a safety shield that encourages two handed operation. Safety first folks. Being the smallest wood splitters on this list, makes it perfect for people who may not have a lot of storage in there house, or garage. Being an electric log splitter does give one really great advantage compared to it’s gas powered counterparts, and that is since there is no gas, there is no fumes, so you can split from the comfort of your own home. I would highly recommend having logs split year round with this beast(Everyone should have logs split in case of emergency), being an electric splitter if you lost power during winter and didn’t have any logs prepared it’s going to be a rough time. Watch this short video if you are interested in the mechanics behind hydraulic log splitters.